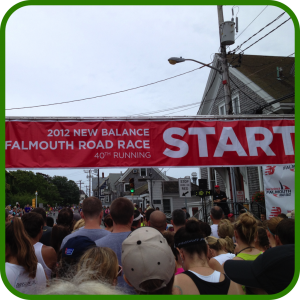 This August I was lucky enough to have an entry at the 40th Running of the Falmouth Road Race. 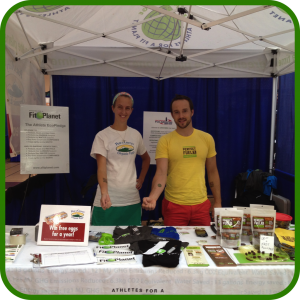 I spent the race weekend in Falmouth working at the race expo at the Athletes for a Fit Planet booth in support of A Fit Planet, our family farm Pete and Gerry’s Organic Eggs, and another Fit Planet Green Partner Perfect Fuel Chocolate. We spent two days supporting the efforts of Athletes for a Fit Planet to make the race a “green event.” We worked hard to encourage all runners to take part in the Athletes for a Fit Planet Eco-pledge. Healthy Fuel Chocolate is a new company started by Nicolas Warren, a triathlete who is passionate about food and how it affects sports performance. His partner on “Team Cocoa” is Director of Operations, Miles Masci who worked with cocoa farmers in Ecuador during his time in the Peace Corps prior to joining up with Nicolas. Nicolas and Miles both have a great passion and energy for what they are doing (Perhaps its due to consuming too much ginseng chocolate? haha!). The chocolate that they are currently marketing comes in a super cool pouch that is actually made out of rice and is reusable. The chocolate is organic dark chocolate made out of raw cacao with 500 mg American Ginseng to provide you with a natural energy boost and natural endurance. A serving size is one piece (14g) of chocolate which contains 80 calories and 6 g of fat. The raw cacao contains omega 3’s and omega 6’s as well as the antioxidant flavanol. 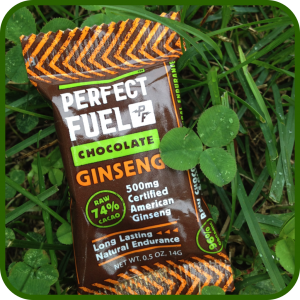 The American ginseng in the chocolate helps with circulation, endurance and can have a calming effect. After meeting Nicolas and Miles I of course had to try their Perfect Fuel Chocolate. On race day at the Falmouth Road Race (a 7 miler) it was raining buckets but I was excited to run with the 13,000 or so runners. I got to the starting area and spent some time quietly sitting and taking it all in and then had my Perfect Fuel Chocolate before heading out for my warm-up run. The chocolate has an intense rich flavor that you will love especially if you love dark chocolate. Dark chocolate can taste bitter to some people but it is definitely my favorite. I headed out for my warm-up run and then hit the starting line. 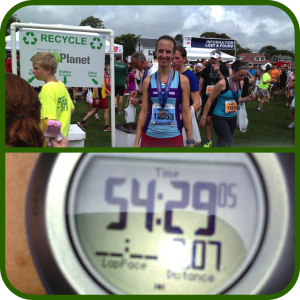 My energy at the starting line was high, the excitement of the race, a great warm-up run and some awesome pre-race fuel! It was hot and humid on the course so I had to stop at every hydration station along the course and was wishing that I had some more Perfect Fuel at about mile five. It is amazing how much the heat can drain you. Overall I was psyched with my run crossing the finish line in 54:29 for 7 miles. Nicolas and Miles are working towards expanding their product line to include more flavors and have launched a campaign to raise money through crowd source funding on Indiegogo. They would like to bring you healthy chocolate inspired by todays athletes. The new flavors would be Organic Coffee, Organic Chia and Sea Salt. I hope they are able to raise the funds that they need because those flavors sound amazing and also provide some great health benefits for athletes. 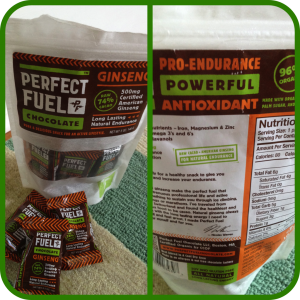 Please be sure to check out Perfect Fuel Chocolate for long lasting endurance! 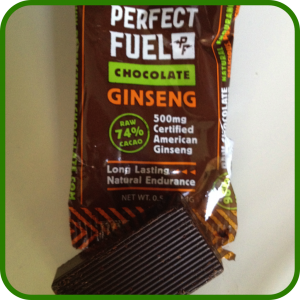 If you like dark chocolate you will love Perfect Fuel! Sounds like a great product. Nice review… and nice race, too! It’s a great start-up company! Have a great weekend!